Yeah, yeah, I know. "Have you been living under a rock?" Maybe, because I haven't picked up a single issue of X-Treme X-Men until very recently. 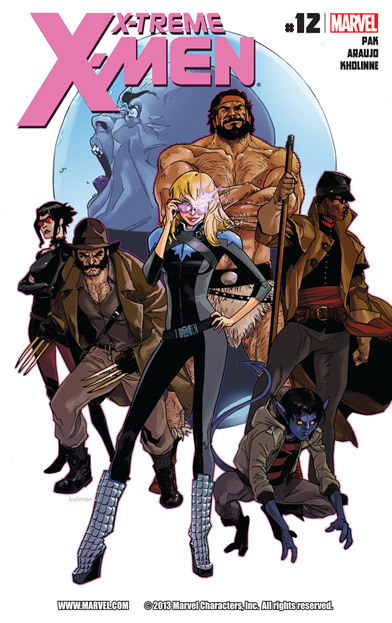 Perhaps one of my favorite writers, Greg Pak, takes on the character Alison Blaire (aka Dazzler) and pulls her through a multidimensional quest to save everyone and everything. Sounds good, doesn't it? I know a lot of people out there are not fans of Dazzler, and I can see why. I'm not one of those people, however. I've loved Dazzler since reading her standalone series from the eighties. Her character is somewhat atypical. Mutants tend to rush headfirst into being superheros (or super villains), using their new powers to benefit mankind. Well, Dazzler sort of took that and put a different spin on it. Intending to only ever use her powers to make people happy through her music, Dazzler was time and time again turned into the reluctant hero. The delicate balance between her personal life, her career, and her heroism made for a nice story. Pak brings much of that same balance here in his X-Treme X-Men series. This twelfth installment of the books is an exemplar of the line that Alison walks and shows how truly developed her character has become in the past issues. Despite the notable change in her overall demeanor, we can still see that the bright and optimistic Dazzler still exists, and that conflict within her makes for a compelling narrative. The writing is met with a mixed response that I had with the art. While expressive and detailed, I found something a bit lacking in the drawings of Dazzler. Andre Arujo seems to be missing something I can't quite put my finger on that takes away a little of the sass and "swag" that Alison usually carries about herself. As promised, the events of X-Treme X-Men are going to have some big impacts on the mainstream continuity. I have a feeling I know what's going to be going down, but I'll leave that for the rest of you to find out for yourselves. For all you Dazzler haters out there: give her a chance; she packs a badass punch!